STG 3. Friday News Roundup! 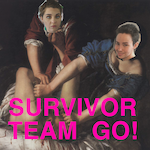 | Survivor Team Go! STG 3. Friday News Roundup! A hairdresser survives sexual assault by Missouri governor Eric Greitens, Andrea Constand testifies against Bill Cosby in re-trial, and Junot Diaz discloses his experiences with childhood sexual abuse in a powerful essay in the New Yorker.